In the midst of a heated presidential campaign, the Newseum and CNN are partnering to create an interactive exhibit that tells the story of the 2016 presidential campaign in real time. “CNN Politics Campaign 2016: Like, Share, Elect” opens April 15 at the Newseum and will be on display through Jan. 22, 2017, the last day of inauguration weekend. 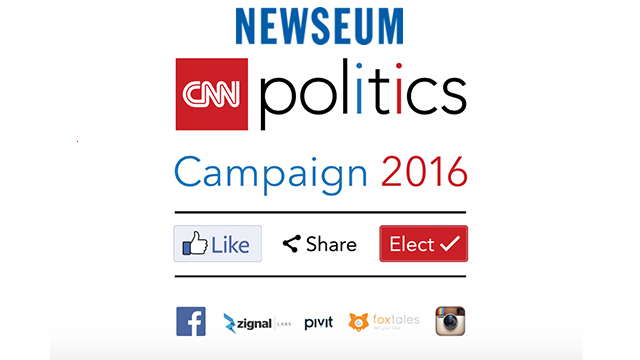 Along with CNN Politics, the Newseum is partnering with Facebook, Instagram, Zignal Labs and Pivit on this innovative educational experience that connects visitors to the campaign trail in relevant, fun and interactive ways. Newseum visitors will be able to explore a variety of groundbreaking on-screen experiences and video presentations that will put them at the center of the campaign. Read more about the exhibit at Newseum.org/CNNPolitics.